Amit Shah was given a rousing welcome by the entire top brass of the state Bharatiya Janata Party. Amit Shah is in Kannur to inaugurate the new district office of the BJP. 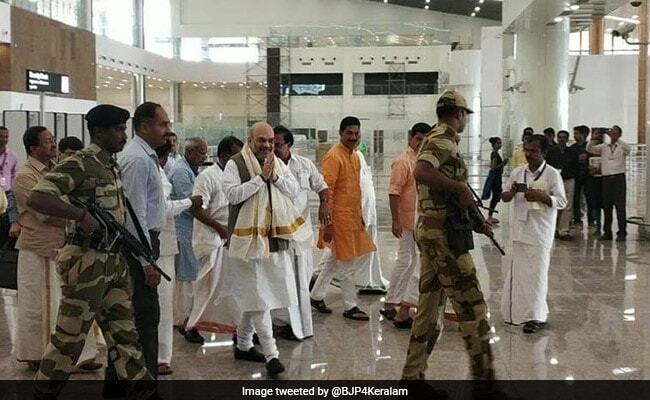 BJP President Amit Shah on Saturday unofficially became the 'first passenger' to have walked through the brand new international airport in Kannur, which will open shortly to the public. The Kerala government tried its best to thwart the landing of Mr Shah, but it had to bend after the intervention of the civil aviation authorities in Delhi. The date of inauguration is yet to be finalised. Mr Shah arrived earlier in the morning and was given a rousing welcome by the entire top brass of the state Bharatiya Janata Party. He is in Kannur to inaugurate the new district office of the BJP. From Kannur, Mr Shah will travel to the state capital and also to Varkala before returning to the national capital on Sunday.